A £2.35m project to revamp a railway bridge has fallen behind schedule. 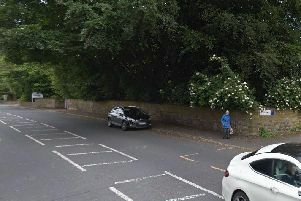 Fall Lane bridge, which connects East Ardsley and Thorpe, has been closed to traffic since October 8, whilst Network Rail and Leeds City Council carry out strengthening work. It was due to reopen on Monday but will now remain shut until January 23 due to “unexpected delays”. A Network Rail spokesman said: “Work to strengthen, paint and waterproof the bridge at Fall Lane is part of the Railway Upgrade Plan to improve the reliability of the bridge for both drivers and rail users. “Unfortunately due to a culmination of minor delays, including issues with access to the work site, the project will now continue until January 23 with engineers working seven days a week to complete the job. A three tonne weight restriction was imposed on the bridge, which crosses the Wakefield railway line that runs between Leeds and Sheffield, in 2010 due to structural problems. And bin collection trucks, goods delivery vehicles and buses to the two villages had to be diverted. Once strengthening work is complete, the bridge will be able to take vehicles weighing up to 7.5 tonnes. Coun Jack Dunn, for Ardsley and Robin Hood, was among those who campaigned for improvements. He said he was frustrated by the delays but urged people to sit tight until the work is done. He said: “When you set a time or date, it does depend on a lot of issues as to whether that timescale can be stuck to. “But the completion is not too far away and we can live with the inconvenience a little bit longer. “It is disappointing but there won’t be too much more waiting now.